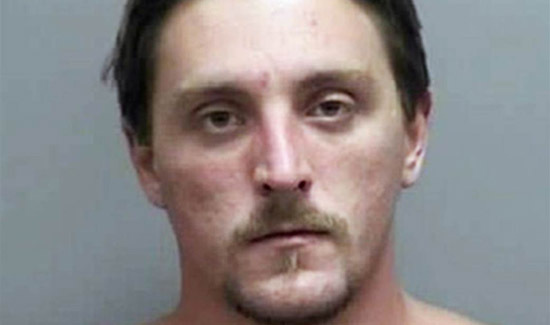 Over 150 officers from local, state and federal law-enforcement agencies were searching for Joseph Jakubowski (pictured above), who they say allegedly broke into the Armageddon Gun Shop in Janesville, Wisconsin, on Tuesday and stole 16 high-caliber rifles and handguns. Police said Jakubowski is considered “armed and dangerous” and was in possession of a bullet-proof vest and helmet. Authorities said they were increasing security presence at local churches because of “anti-religion sentiment” contained within a 160-page manifesto they believe was written by Jakubowski and sent to Trump at the White House. Police said at a press conference on Friday that Jakubowski had been “highly agitated” by national politics recently and an associate of his claimed the wanted man had spoken of a plan to steal guns and carry out an unspecified attack. Bethlehem Lutheran Church in Sun Prairie, Wisconsin, canceled its services on Sunday after a suspicious man who looked like Jakubowski stopped by the church on Thursday asking questions, according to a statement from the Rock County Sheriff’s Office. “We were taking extra precautions, just in case,” he said. The Sun Prairie Police Department told NBC affiliate WMTV on Sunday afternoon that the man who visited the Bethlehem Church late last week was not Jakubowski and was not related to the police’s investigation. Investigators have already followed up on around 400 tips and leads, according to the sheriff’s department statement. The FBI offered a $10,000 reward for information leading to Jakubowski’s capture.